Mark James (AKA The 45 King) is a world renowned DJ/ Producer pioneer in Hip Hop music. His breakbeat classic ''The 900 Number'' has been a staple among DJs since its release in 1987 (notably featured as the song to ''The Ed Lover Dance'' on MTV's Yo MTV Raps). With a prolific output and catalog of beats, he has set out to release a series of limited edition 45s with brand new and never before heard music. 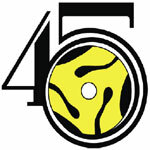 The Third Album is third in a series of unique, ''mini 45 RPM albums'' featuring 45 King's signature sound; breaks chopped and looped to perfection.